On July 9th, 2019 Microsoft will end all support for SQL Server 2008. How can you prepare your organization? Start by understanding your options. Doing nothing is not an option this time. 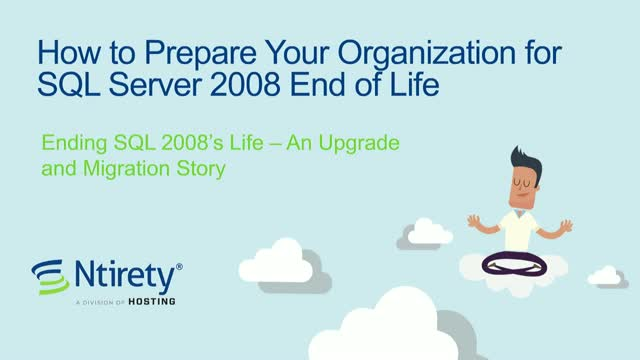 Data security is a risk to your organization, as all critical patches and security updates for SQL Server 2008 will end. Your Lack of compliance with industry standards and applicable regulations may lead to security breaches, data loss, litigation, and reputational risk. • The many advances since SQL 2008. The recent merger of Hostway and HOSTING didn’t just multiply our office space and workforce. More importantly, it’s allowed us to meld our most valuable offerings and the expertise of each company to provide a healthy list of unmatched products and services. This is a particularly critical time for IT organizations as they come to grips with the fact that the “easy migration” to public cloud preached a few years ago is not so simple. And “One-size-fits-all” is a risky and costly approach to take when you’re trying to control IT spend, maintain compliance, and stay secure—all while bringing real value to the entire business. Monitoring Insights: Offering an unmatched, game-changing single view of your infrastructure, operating systems, and applications. Guidance Level Agreements (GLAs): Uniquely going ten steps further than standard SLAs to offer a regular cadence of actionable recommendations that guarantee positive outcomes. Critical Availability Services: Offering the BEST availability guarantee in the industry. Database Services: Not many companies in our space also offer full data lifecycle management capabilities. A service not to be understated, Gartner Analysts have found that nearly 90% of businesses have little or no analytics expertise in house. Around July 9th, 2019 Microsoft will end all support for SQL Server 2008. How can you prepare your organization? Start by understanding your options. Join Hosting’s Dan Waymire, SR. Manager of Unified Cloud, to see first-hand how Hosting can help your organization monitor assets in any environment, all within a single pane of glass. As IT professionals distribute workloads across various clouds, it is more critical now than ever to manage the performance, availability, and cost of your IT assets. In this webinar, you will learn how you can effectively manage all of your environments, as Dan demonstrates the true value of adopting a single-platform monitoring tool. In this webinar, learn the benefits of moving your workload to a Database-as-a-Service (DBaaS) environment and the key differentiators between Amazon RDS and Azure SQL Database. Coming so quickly on the heels of SQL Server 2016, one has to wonder what astounding features SQL Server 2017 brings to the table. While these new features may not be as momentous as the previous release features, some do still carry a “wow” factor that are worth taking a closer look at. Join Rodney Landrum, Senior DBA/BI Consulting Services at Ntirety, a division of HOSTING, as he discovers several of these new features and demonstrates how they can benefit your organization. Microsoft Power BI is an affordable, powerful data modeling and visualization tool, with widespread adoption and universal appeal for many reasons. The main reason everyone loves Power BI is the rapid update schedule and all of the cool, new features regularly added to both the desktop and web versions. With these rapid updates, it can be hard to stay on top of what is available from one release to the next. During this session, attendees will learn how they can reduce their AWS spend through invoice transparency, architectural optimization and strategic procurement. To take full advantage of platforms such as AWS or Azure, organizations need to be able to manage cost, compliance, security, policies, and overall visibility. Many are finding that this is a lot to tackle on their own. Join Tricia Pattee, Vice President of Product, and Mike McCracken Vice President of Advanced Solutions for this interactive seminar where they will discuss HOSTING’s built-in optimization solutions that prevent wasted spend and help maximize the move to public cloud. The average investment to meet cloud compliance obligations is $250,000 per year, and the fees for not complying can be as much as $100,000 a month. So while the investment is worthwhile, many companies are unable to achieve such standards due mainly to budget constraints and a lack of expertise. We also demo a couple new solutions such as an industry-leading compliance dashboard and a (free) Compliance Posture Evaluation tool recently launched to provide you with actionable items for passing an audit. In a special webcast, Bill Santos, President at HOSTING, and Wayne Shaw, Cloud Architect at HOSTING, cover leading DRaaS and Ransomware solutions that can help protect your company from a data disaster. Join Rodney Landrum, Consulting Services Manager at Ntirety, a division of HOSTING, as he demonstrates his favorite features of the latest Microsoft SQL Server 2016 Service Pack 1. • New information in Dynamic Management Views and SQL Error Log that will make your DBA's job easier. At HOSTING, we understand the importance of setting up success criteria (KPIs) to measure your IT team’s impact (value) in direct partnership with the business. No company is safe from a Ransomware attack (malicious forms of software programmed to steal company data and hold it for "ransom"). However, technology has allowed us to mitigate these attacks by implementing proper recovery systems that can ensure that cyber criminals will not see a dime from your business. "Cyberhunting" actively looks for signs of compromise within an organization and seeks to control and minimize the overall damage. These rare, but essential, breed of enterprise cyber defenders give proactive security a whole new meaning. Join me, Mike McCracken, Director of Professional Services at HOSTING, and Chris Dodunski, CTO of Phirelight Security Solutions on October 27th at 3 PM EST for the live webinar, Cyber Threat Hunting: A New Dimension of Cyber Intelligence. -A 20 min live demo of Phirelight's security solution. Be sure to bring your questions, there will be a live Q&A during the event. See you there! The threat of Distributed Denial of Service (DDoS) attacks is a growing problem for mission-critical websites, such as eCommerce shops, SaaS applications, gaming forums, and University portals; in addition, politically or artistically important organizations and journalists can be especially at risk of attack, due to the nature of their website content. The company CloudFlare delivers DDoS protection to over 4,000,000 websites globally, from personal blogs to large enterprises, while also offering a free protection program for respected free speech, public interest, and civil society organizations, called “Project Galileo”. •Best practices for mitigating against these attacks and how CloudFlare’s “Project Galileo” protects political and artistic organizations. Recently the president of the American Medical Association referred to healthcare IT as the “snake oil” of the 21st century. He referenced ineffective electronic health records, an explosion of direct-to-consumer digital health products, and apps of mixed quality. In this webinar, leading healthcare expert, Marion Jenkins, will cover the major causes of this sorry state of affairs, and discuss how healthcare technologies can actually help medical practices deliver better patient care. 1.Who is to blame? There is plenty to go around. Physicians? Healthcare IT vendors? The government? The solution must get past blame and address solutions. 2.How can clinical users and executives “break through” the logjam of sub-optimal IT systems, poor implementation, and ineffective workflows? 3.Is it possible to utilize new technologies to improve patient care, without breaking the bank and further hurting the clinician/patient experience? 4.What are the necessary changes that enable technology to actually provide benefit in a healthcare setting? HOSTING is a leading provider of managed cloud hosting services for mission-critical applications. Using enterprise-class networking and connectivity technologies, we provide the highest levels of availability, recovery, security, and responsiveness. We own and operate six geographically-dispersed data centers across the United States under an ITIL-based control environment independently validated for compliance against the PCI DSS and SOC (formerly SAS 70) frameworks. We offer monthly How To and Best Practices webinars for Managed Cloud Hosting.